The Fujifilm 18mm f2 R is a wide-angle prime lens with bright f2 aperture designed for a variety of applications, including landscapes, architecture, interior work, travel and low-light photography. Boasting a compact, metal-barrel design, this solid, yet easily portable lens brings a bright f2 aperture and is made up of all-glass aspherical lens and other elements that are designed to deliver edge-to-edge sharpness. 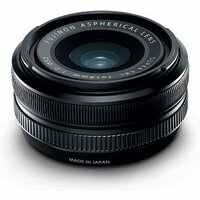 Fujifilm 18mm f2 R Fujinon Black Lens. Excellent Condition.